Wear and tear is probably responsible for most of the damage done to antique carpets and rugs. The best way to avoid this is not to walk on them. Alternatively, try and limit the amount of traffic they have to endure, for example, by placing rugs to one side of a room and not putting them in front of doorways. Rotate (turn or replace carpets) to distribute wear. Carpet protectors, made from plastic strips or heavy woven canvas, can be useful if you need to protect a carpet from heavy wear, but they are not always appropriate as they can be a tripping hazard. Stiletto heels can do a lot of damage because they can pierce holes right through the carpet. Heavy furniture can also cause damage by leaving permanent indentations where the fibres have been crushed. You can avoid this by repositioning your furniture every now and again, and by using Castor cups to spread the weight. Damage to a carpet or rug, such as holes, tears, loose fringing or side finish, should be treated as soon as possible by a textile conservator. Use a synthetic underlay, such as poly felt, beneath carpets and rugs if they would otherwise lie on stone or floorboards. This protects them from abrasion and from being stained by floor finishes (e.g. wax) and also reduces the risk of insect infestation. Traditional woollen under felt is very attractive to moths and carpet beetles and can harbour infestation. Antique carpets are usually made from wool or silk and are susceptible to insect attack. To prevent this, check under your carpets and rugs once or twice a year. Look for signs of insect activity such as holes, webbing, casts and frass (powdery insect droppings). If you find any, thoroughly vacuum both sides of the carpet. Use the upholstery attachment and cover the nozzle with a piece of stocking. Repeat weekly until at least six weeks after the last signs of infestation were seen. You will also need to check other areas of the house. A conserved carpet with cotton lining and Velcro attached ready for hanging. Some carpets and rugs are simply not in good enough condition to withstand the wear and tear caused by use. Others are vulnerable to damage because of the way they were originally made. Kelims, for example, are a type of flat woven carpet that doesn't have a pile. They have long slits where the weaver changed colour, which are easy to snag and tear. It is best to hang kelims for display. Rugs and carpets can be hung using the Velcro method. This is suitable for medium and heavy weight textiles such as quilts, tapestries or rugs because the weight of the textile is supported evenly along the whole of the top edge. The soft or looped side of the Velcro is machine stitched to cotton tape, which is in turn hand stitched to the top edge at the back of the lined textile. The width of Velcro tape depends on the size and weight of the textile. The hard or hook side of the Velcro is stapled (using stainless steel staples) to a batten which is in turn fixed to the wall. 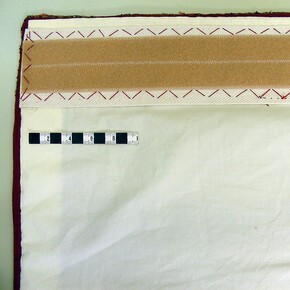 A loose lining can also be attached to the batten to help protect the reverse side of the textile. 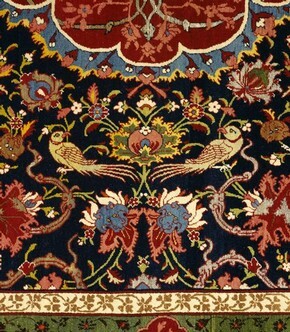 If the rug is very large or heavy it may be necessary to adapt flat mounting techniques. Whether they are hung on a wall or laid on the floor, damage can be reduced by placing carpets and rugs out of direct sunlight and away from heat sources such as radiators. Cats and dogs can cause a lot of damage to antique carpets and rugs. Removing pet hair, for example, usually requires vigorous vacuuming. If your carpet or rug is very valuable, you may need to keep it in a room that your pets don't use, otherwise you will have to accept the damage they cause. Flea infestation is best treated by first focusing on the source of the fleas, that is, your pet. Unfortunately, 95% of a flea population consists of eggs, larvae and pupae. The larvae live in undisturbed areas and feed on the dirt left by adult fleas, dead skin, etc. As with other pests, the best way to remove fleas, eggs, larvae and their food sources from carpets and rugs is by thorough, regular and gentle vacuuming. Firstly, size permitting, turn your carpet or rug upside down onto a clean sheet and gently tap the back to remove loose dirt and grit. Repeat this process until all the loose dirt has been removed. Gently vacuum both sides of the carpet or rug, as well as the under felt or lining. Use moderate suction and a covered nozzle, and vacuum in the direction of the pile. Washing, dry cleaning and commercial carpet cleaning are not usually appropriate for antique carpets and rugs. Trying to clean the surface with a damp cloth or proprietary carpet cleaner can cause damage because it deposits wet dirt at the base of the knot or weave. Once dried, this can be very difficult to remove. If vacuuming is not enough, consult a specialist. If you are careful about how you display, store and use your carpets and rugs, they may only need cleaning by a specialist every 25 years or so. All spills, such as food and drink, water damage from a leaking pipe or radiator, or urine should be dealt with straight away. Blot off excess water with white towels or white kitchen paper to absorb as much moisture as possible, repeating the process with clean towels or paper until all the moisture has been removed. If the dyes are not running, you can lightly sponge the area with cold water and then blot it dry again. Don't make it sopping wet and resist the temptation to press down hard or rub the surface of the carpet or rug. When you have blotted it so that it is as dry as possible, you need to get cool air circulating to dry it off and to prevent mould growth. Support the damp area slightly above the floor if possible. Remember, textiles are much weaker and more easily damaged when wet, so handle them gently. If the spill has caused colours to run, or if this treatment is not effective, contact a specialist immediately. The best way to handle and store carpets and rugs is to roll them. Some of the worst damage to carpets and rugs is done when they are folded up, tied tightly with string, and dumped under the bed, or into an attic or basement. They should be wrapped for storage in clean cotton sheets and tied off with cotton tape. They should be wrapped for storage in clean cotton sheets and tied off with cotton tape.